There is an historic charm about Chappell Hill, complete with festivals, lavender, wine & museum. Chappell Hill is a small rural unincorporated community in the eastern portion of Washington County, Texas, United States. It is located along U.S. Highway 290 roughly halfway between Brenham and Hempstead. The wife of local trader Jacob Haller is credited with founding Chappell Hill on 100 acres she bought and donated as a townsite. Her name was Mary Hargrove Haller and she named the town after her grandfather, Robert Wooding Chappell. The town became a commercial center for the local cotton plantations and in 1847 they had a post office granted to them. A Masonic Lodge was chartered in 1851 and the town incorporated in 1856. With more than 25 homes and buildings listed in the National Register of Historic Places, Chappell Hill offers many ante-bellum structures, antique stores and craft shops. The area is lush and green with pastoral views and rolling hills. Ponds and creeks are abundant in the area as well. 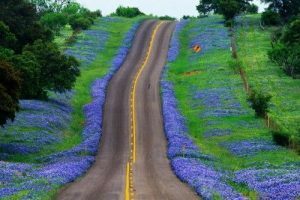 A favorite area for viewing Bluebonnets in April and May and this charming town is only an hour from Houston. If you go to view properties on our website on the navigation bar and type in Chappell Hill you can add Farms as well as Lots and Land and you will see a wonderful selection of properties from 130+ acres with a grand traditional ranch home for $3,000,000 + or a charming vintage victorian home built in the 1850’s on 2 acres shaded by majestic oaks in the heart of town in the $600,000 or 30 acres in the $200,000 range and you can build your own dream home. Maxine and Ellen and can help you find the perfect place in Chappell Hill.